Designed for stitching such products as tents, tarps, awnings, truck covers, auto, marine and furniture upholstery, sails, matting, carpets, polishing wheels, mops, luggage, construction barriers, dield covers, divider curtains, fabric structures and heavy bulky products. 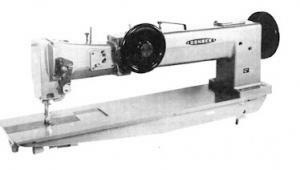 Model 745R suitable for stitching double seams and lap seaming. Available In Arm Size 20", 30"